Natural Wood Daito Sword | BUDK.com - Knives & Swords At The Lowest Prices! Practice your sword fighting skills with this wooden training daito! 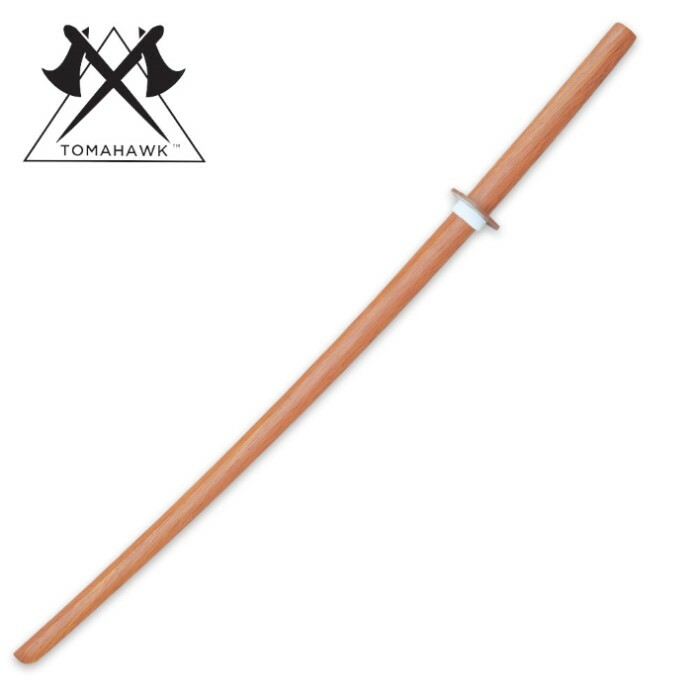 This is a great item for the intense training required to master the art of sword fighting! This is a great product for the price, good hardwood construction and has nice weight for training. this bokken is well worth the money. It is of a quality that is only found in much more expensive bokkens. It is perfect in weight and size for women and short stature Students, which is hard to find. The guard is way to loose which is of no matter for aikido students since we take the tsuba off anyway. buy this one it is well worth the money!! this swords is amazing!! i bought two and they are perfect for practice. the guard can be a bit loose but all you have to do is press the white hold it down. this sword is perfect 5 overall! Poor design but still is good for training with, and great if you have two of them, to practice with your friend in sword to sword combat. Editor's Note: Thank you for your comments. We have updated the review to reflect the appropriate spelling. Very nice for forms. Great weight to it. Recomend for fighting as well.